JVC DLA-X900R leads 4K projector line-up for 2014 | What Hi-Fi? JVC has revealed details of its 2014 4K projector line-up, with three new products: the flagship DLA-X900R, the DLA-X700R and the DLA-X500R. The new JVC projectors are priced at £10,299, £7,299 and £5,299 respectively, each coming with JVC's 3D kit (two pairs of RF glasses and an RF emitter). The DLA-X35 remains for 2014, alongside those existing 3D accessories. 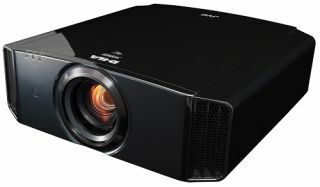 JVC claims the new range of home cinema projectors delivers the highest native and dynamic contrast levels on the market, with the top-of-the-range X900 projector claiming 150,000:1 native contrast (1,500,000:1 dynamic contrast). The X700 and X500 claim native contrast ratios of 120,000:1 and 60,000:1 respectively. The new D-ILA projectors promise to deliver "substantial improvements in image quality" thanks to upgrades to JVC's e-shift technology, Intelligent Lens Aperture and support for 4K (60p) signals. Both the X900 and X700 are ISF certified to boot, with THX 3D certification pending. The sixth-generation of JVC's D-ILA technology claims to have "a pixel gap that's 40% narrower than the previous chip", so that should mean a smoother picture. A 10% improvement in light efficiency boosts the light output to 1300 lumens, too. Elsewhere there's a new Clear Black feature for local contrast control, while the company's Clear Motion Drive aims to improve fast motion handling and reduce noise. There's also a new smartphone app that promises remote control of the projectors, including picture setting adjustments, which sounds interesting. Look out for the three new JVC projectors in November, we look forward to bringing you reviews of the new projectors as soon as we can get our hands on them.